Somewhere deep in the Ouachitas, roughly 29 miles upstream of Lake Greeson, the trickles and springs of the forested mountain sides gather together to form one of Arkansas’ most beautiful and diverse streams. Tumbling through the mountains, the Little Missouri is a classic "high country" stream. Deep pools, sparkling whitewater and boiling runs define the "Upper" river. It is home to native Smallmouth, Rock Bass and sunfish. The Arkansas Game and Fish Comm stocks Rainbows in the Albert Pike Campground area during the winter and spring, adding just a bit more diversity and even more fun. Most all of the Ouachitas run east to west from the edge of Little Rock well into Oklahoma. About three miles downstream of Albert Pike, the Little Missouri heads south, cutting gaps through three separate ridges. This area is known as Winding Stair (or Staircase) and it is certainly one of the most spectacular places in all of Arkansas. If you are up for a bit of a hike (including a 250 foot vertical climb), you can take the Winding Stair Trail, downstream, to some of the more rugged parts of the river. Or you can start fishing at the confluence of Blaylock Creek and the Little Missouri near the trailhead and work your way either upstream or down. Either way, this part of the Little Missouri is well worth the effort of the drive and hike. About twelve miles downstream the river runs into Lake Greeson, one of the prettiest lakes in the area. Summer sees scads of people on the lake, boating, skiing, jet skiing, swimming and fishing. During the winter, you’ll see mostly Bald Eagles gliding over the water into the big trees on the rocky banks, and not many people. Below Lake Greeson’s Narrows Dam is the Lower Little Missouri and the heart of our fishing here. 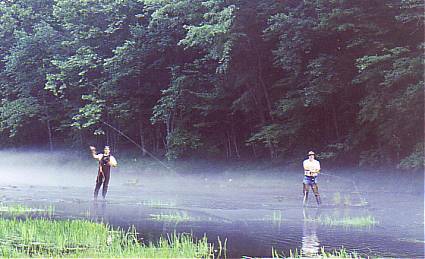 The tailwater is full of trout and a number of Smallmouth, as well as Kentucky and Largemouth Bass, sunfish and bluegills and even some stripers and pickerel. But most everyone comes here for the trout fishing. From late February through May we have a great March Brown hatch and, in the late summer through October, the Light Cahills make the dry fly fishing pretty spectacular. Of course, these aren't the only two insects we have here, but they are the "glamour" hatches of the year. There are always midges and caddisflies around, as well as, some stoneflies primarily in the winter and spring. AGFC stocks rainbows from October to April, usually in the order of about 70,000 each season. Best time for quantity of trout is February through April. Best time for quality is from June through October. We presently have a Seasonal Catch and Release Area in the first half-mile below the dam from May 1 to October 15. The fish in the Catch and Release Area really, really like the conditions in the river during the summer. They all think they're about twice as big as they actually are. Don’t be surprised to have one of these guys take you on a "line ripping" 15 or 20 yard run, only to find out the fish is only 13 or 14 inches long. However, the longer these fish are in the river the more educated they become. They can get real picky about what you’re throwing and how well you throw it. You will have two or three fish take a look at your fly every time it hits the water. Just be patient and wait for that one out of ten that decides to take a shot at you. During the winter and spring, fishing here is a beginner’s dream. Lots of easy fish, ready to hit almost anything you throw. If you want your kids to learn to Fly Fish, and catch fish, this is definitely the place to be. Of course, that goes for more than just the kids! The Little Missouri is certainly a jewel of a stream, one of the best classrooms you will ever set foot in. Many people consider this "Home Water" and find fishing here very comfortable and familiar. I’ve been standing in this river a long time and never get tired of being a part of its flows.